Jai Prakash Sharma looked gloomily into the chilling tanks at the Mewat milk cooperative: they are only half full these days, thanks to a delay in India's annual monsoon rains that has robbed cattle fodder of nutritious moisture. 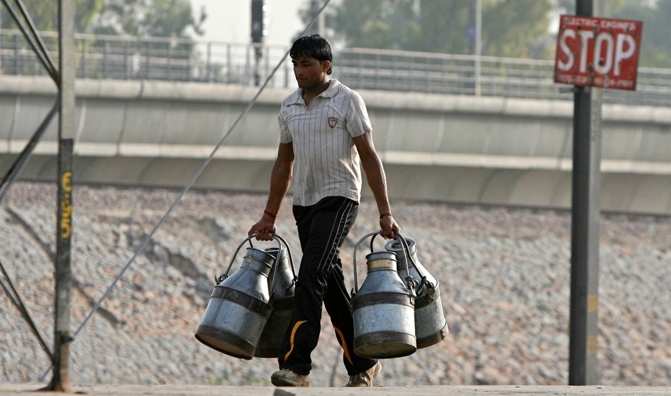 "If there are not sufficient rains in the next few days, some farmers may start selling animals for slaughtering," said Sharma, manager of a cooperative in Haryana that supplies milk to the capital, New Delhi. As dairy farmers fret over the risk to earnings due to the vagaries of the monsoon, the squeeze in supplies of milk is adding to inflationary pressures that Prime Minister Narendra Modi's government inherited when it came to power in May. Image: Poor monsoon wil impact diary production. Even without unpredictable weather, ensuring supplies of dairy products is emerging as a long-term policy headache in a country of 1.2 billion people where a sustained period of rising incomes has changed diets and lifted demand for protein. India's much-acclaimed dairy co-operative model helped it to emerge as the world's largest milk producer in what became known as a "white revolution". But a system that relies on millions of farmers each owning a few low-yielding cattle, is now not enough, as India's cows' average milk yield of 2 to 3 litres per day is about one-tenth of the global average. Earlier this month the government imposed export restrictions on a raft of farm commodities and ordered a crackdown on hoarding to control rising food prices, after wholesale price inflation hit a five-month high. Image: India's much-acclaimed dairy co-operative model helped it to emerge as the world's largest milk producer in what became known as a "white revolution". Soaring prices of basic goods such as milk and potatoes lifted retail food inflation in May to 9.40 percent and there are fears of worse to come, with rains so far 42 percent below normal due to the sluggish progress of the monsoon towards agricultural belts in the northwest. Prices for dairy products, which account for nearly one-sixth of the goods in the retail food price index basket, rose by more than 11 percent in May from the same month a year earlier. High food inflation could persuade the Reserve Bank of India (RBI) to prolong its hawkish monetary policy even if weather conditions eventually improve and supply pressures ease, HSBC said in a recent research report. 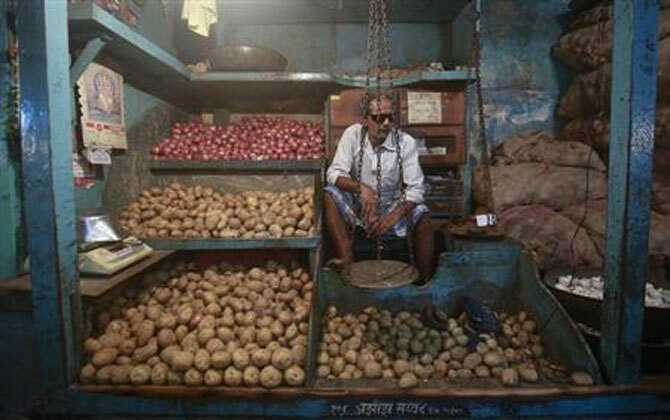 "To be sure, the RBI cannot address food inflation via interest rates," it said. "But the RBI still needs to contain inflation expectations in the interim, and prevent second-round effects from driving up core prices." Image: Soaring prices of basic goods such as milk and potatoes lifted retail food inflation in May to 9.40 percent. According to dairy industry estimates, India is facing a 1.5-2.0 percent gap between supply and demand this summer despite total milk production increasing to 140 million tonnes in financial 2013/14, up 6 percent from the previous year. At the Mewat cooperative outside the capital, Sharma said that his dairy has been unable to meet demand, even after raising prices paid to farmers by 30 percent. 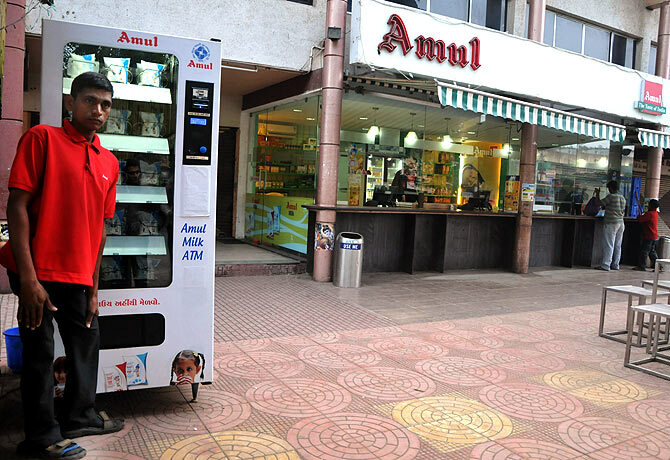 Amul, the country's largest dairy cooperative with an annual turnover of more than $3 billion, raised retail prices by 5 percent in May, but still can't match supply and demand. "We are again considering raising procurement prices in a week or so, as there has been almost zero increase in milk supplies due to the delay in the monsoon," K. Rathnam, managing director of Amul Dairy, told Reuters by phone from the company's headquarters in the prime minister's home state, Gujarat. 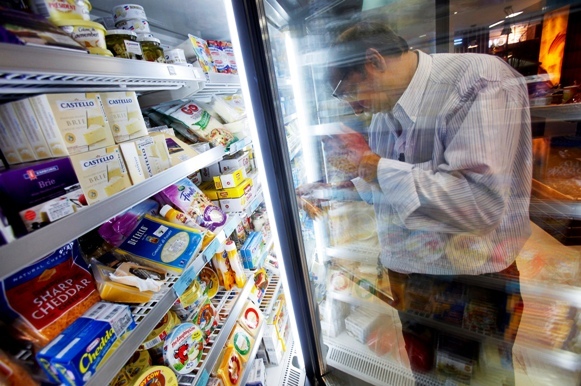 Image: A customer examines a packet of cheese in the processed dairy food section of a supermarket in Mumbai. Some government officials have suggested cutting the import duty on skimmed milk powder to 15-20 percent from 60 percent to curb rising prices, but such a step would be politically difficult because it would introduce competition for dairy farmers who are already struggling with a jump in fodder costs. India's dairy market, of which cooperatives and companies like Nestle control about one quarter, with a host of smaller dairies supplying rural areas and small towns, has been tightening for years. 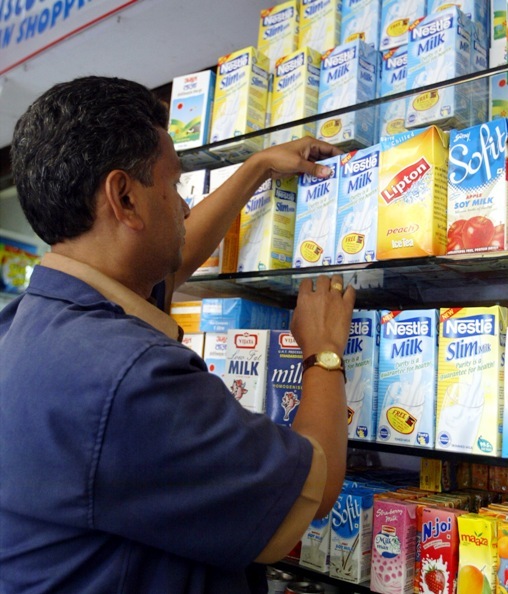 Amul says it has raised milk prices 19 times since 2006. Farmers in Aakera village, one of the largest suppliers of milk in Mewat district, are now selling their milk to Sharma's cooperative for 41.10 rupees ($0.68) a litre, up from 30.80 a year ago. “We need big cattle farms with high-yielding cows to meet the growing demand," said Sharma. "Otherwise, we may find it difficult to buy milk even at 50 rupees a litre from farmers." Image: India's dairy market, of which cooperatives and companies like Nestle control about one quarter, with a host of smaller dairies supplying rural areas and small towns, has been tightening for years.